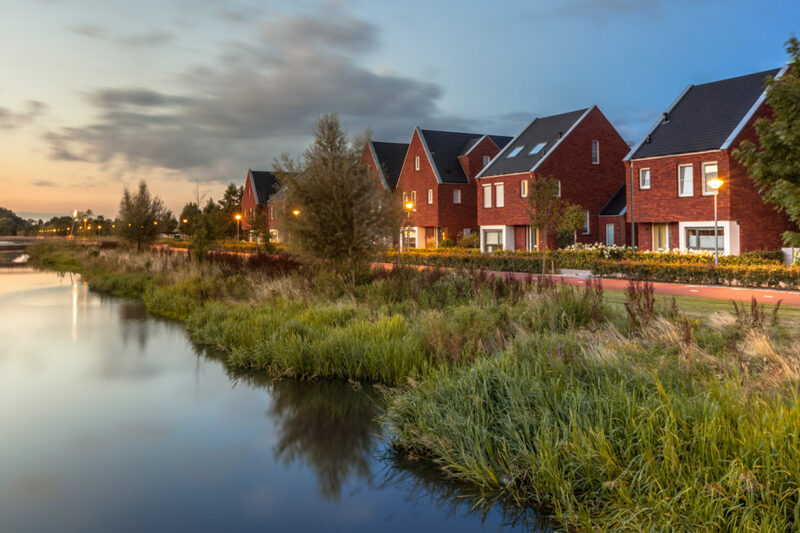 Long exposure night shot of a Street with modern ecological middle class family houses with eco friendly river bank in Veenendaal city, Netherlands. Consider the brick. It is ubiquitous. We build all sort of things out of bricks: Foundations to houses, building, and other structures; buildings and houses and other structures, themselves; fireplaces; in some rare instances, we pave roads with them. A simple way to cut water waste with every flush is to sink a brick into your toilet’s water tank, displacing a certain amount of the water that would otherwise got to fill it. Doorstops, supports for temporary tables, lifts for furniture — the list goes on. A brick is an invaluable tool in our various societies. Which becomes an interesting leaping-off point in architecture. 3d-printed buildings are a reality now1. A 3D-printed home can be put together1. And we, as the designers, get to decide what components make up the material that created those structures. Considering the creation of not merely sustainable architecture, but smart, green architecture, and we can create buildings that house us, feed us, and even purify our water, recycling a great deal of it. So why not create such living structures? Talk about locally grown! A resident could easily wake up in the morning and head to their terrace to pick a few fresh fruits and veggies for breakfast. On-site water recycling could easily benefit from the use of water hyacinth, which does an impressive job of purifying water, and could easily be part of an overall strategy of reducing water waste by reusing water within a facility. When I lived in the SF Berkeley area, a local grocery store planted vegetable gardens alongside its building, in unused green space. People would bicycle up, pluck a tomato or cucumber, and go on their way. No one took more than they needed, and it was freely available to all. Inspired, here in Central PA, my 7-year-old and I followed an online recipe for seed bombs and made some. We biked around to the unused green spaces in our local parks a seed-bombed them. Fresh produce should be available to all in the spring — particularly the squash. This versatile veggie grow easily and cross-breeds like crazy. There was already a crop of squash for people in the fall, a few weeks after we’d seed-bombed. All of these technologies are in use now, today. With the will, we could produce such living structures to house and sustain their occupants. This is about embracing tech we already employ to solve many problems we face today. There would be side benefits, as well. If your home grows its own produce, your need to go to the store will be greatly reduced. That means fewer cars and light trucks on the road, heading to the store, and as a side effect, fewer long-haul food-delivery trucks. That means a lessening of pollution generated by those vehicles and a drastic reduction in their demand for fossil fuels. It’s a win all around! So please, let’s get on-point. Let’s build not only sustainably, but in these ways that embrace green architecture, living buildings, and self-sustaining, in-structure agriculture. Jønathan earned his MFA in writing at the California College of the Arts in Spring 2005, and earned his bachelor’s in English from the University of Iowa in Iowa City in 1997. He is a futurist parent, writer, and educator. He lives in Central Pennsylvania, where he teaches writing and literature (including science fiction/futurism) at Bucknell University. Jønathan authored Burn which received the Wordweaving Award for Literary Excellence and authored Machina. His most recent book is Minnows: A Shattered Novel, published by JEF (Journal of Experimental Fiction) Books.